We are glad to introduce an all-new product bundle that has everything you need with your favorite page builder – The all new Mini Agency Bundle! We’ve observed a lot of our customers purchased the Ultimate Addons for Beaver Builder and the Astra Pro addon separately. Many of you even got in touch to ask whether you can use any of the premium sites that were available to the agency license owners only. 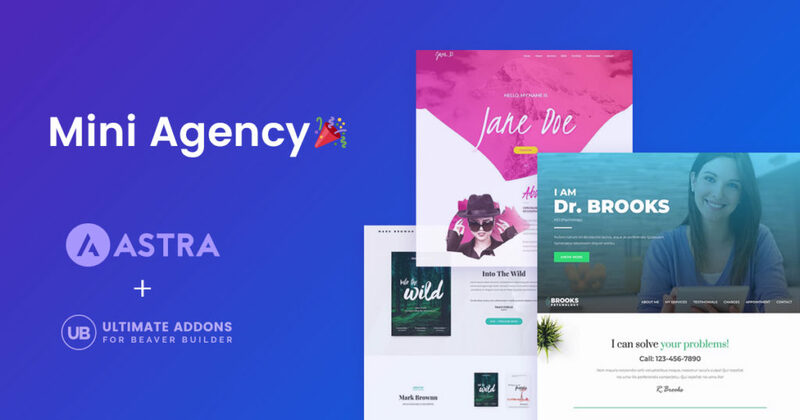 This is how we thought of the Mini Agency Bundle – a package that gives you the Astra theme Pro addon, the Ultimate Addons for Beaver Builder, WP Portfolio plugin and a huge collection of ready-made full website templates created using the Astra theme, Ultimate Addons, and Beaver Builder! So, this is the time you were waiting for! If you own a licensed copy of the Ultimate Addons for Beaver Builder, you can upgrade to the Mini Agency Bundle by just paying the difference here. After all, it’s something that you wanted and we offer! Upgrade now to be able to use the full website templates, lightning fast Astra theme and the highly customizable Astra Pro Addon along with Beaver Builder.